President-elect Donald Trump gives his acceptance speech during his election night rally, Nov. 9, 2016, in New York. Americans have elected Donald J. Trump as the 45th President of the United States. The Republican Party candidate defeated the Democratic Party nominee, Hillary Clinton. The result is a shock to most political experts and pollsters. On Tuesday morning in the U.S., most major polling groups were predicting a win for former Secretary of State Clinton. But in the early hours of November 9, Clinton called Trump to concede the election. The president-elect spoke to a crowd of supporters in New York City a short time later. He congratulated Clinton and praised her campaign effort. And he called for the nation to unite. "And I congratulated her, and her family, on a very, very, hard-fought campaign. She fought very hard. Hillary has worked very long and very hard over a long period of time, and we owe her a major debt of gratitude for her service to our country. I mean that very sincerely." Trump called for the nation to unite. "Now it's time for America to bind the wounds of division. We have to get together. To all Republicans and Democrats and Independents across this nation, I say it is time for us to come together as one united people." Trump’s win brings to an end eight years of Democratic Party rule of the White House. Political experts have said the change could lead to the undoing of many of President Barack Obama’s policies. One of Trump’s first targets may be the Affordable Care Act, a health care law signed by President Obama in 2010. Trump criticized the measure repeatedly during his campaign. He promised supporters he would cancel it if elected. Trump entered Election Day at least three-to-four percentage points behind Clinton in many final voter opinion studies. But he pulled off important victories in Ohio, North Carolina and Florida, states rich in electoral votes. He also won other states that he was already expected to win. All the major U.S. news organizations declared victory for the 70-year-old Trump after he won the state of Wisconsin. It gave him the final electoral votes that pushed him over the 270 needed to win the White House. The billionaire businessman has never held public office. He is only the sixth candidate to win the presidency without ever having held elective office. Trump is also the oldest American elected president for a first term. Caty Weaver and Anne Ball wrote this report for VOA Learning English, with materials from the Associated Press. Ashley Thompson was the editor. 07:50 UTC: Donald Trump has been elected the 45th president of the United States of America. He is now speaking at his election headquarters in New York City. "Working together, we will begin the urgent task of rebuilding our nation and renewing the American Dream," Trump said. 07:40 UTC: CNN is reporting that Hillary Clinton has called Donald Trump to concede the election. By doing that, she is admitting that she has lost to presidential race. 07:20 UTC: Donald Trump is reportedly on his way to his election headquarters in New York City, where he will address a crowd of supporters. Supporters of Republican presidential candidate Donald Trump react as they watch the election results during Trump's election night rally, Tuesday, Nov. 8, 2016, in New York. 07:05 UTC: Hillary Clinton's campaign chair, John Podesta, just spoke from the Javits Center in New York City, where many Clinton supporters have gathered for the night. He told the anxious crowd to go home and get some sleep. He said the Clinton campaign will not be giving a speech tonight, but will instead wait for all of the votes to be counted. "We'll have more to say tomorrow," Podesta said. 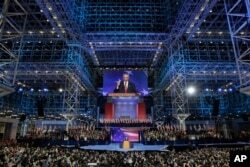 John Podesta, campaign chairman, announces that Democratic presidential nominee Hillary Clinton will not be making an appearance at Jacob Javits Center in New York, Wednesday, Nov. 9, 2016 as the votes are still being counted. 06:50 UTC: Trump has 264 electoral votes, while Clinton has 215. 06:48 UTC: Pennsylvania, and its 20 electoral votes, has gone to Donald Trump. 06:00 UTC: The states of Pennsylvania, Michigan and Wisconsin are still "too close to call." That means that the number of votes for Trump and the number of votes for Clinton are very close. These states will ultimately decide the 45th president of the United States of America. The last state, Alaska, has closed its polls for the night. Now, America and the world waits. 05:25 UTC: Hillary Clinton has won Nevada and its 6 electoral votes. 05:15 UTC: The Associated Press says Donald Trump has won Iowa's 6 electoral votes. 04:57 UTC: Donald Trump has won the southern state of Georgia, gaining 16 more electoral votes. His total is now 239. Hillary Clinton has 209. 04:20 UTC: The latest electoral count: Donald Trump has 217 electoral votes; Hillary Clinton has 197. Remember: the magic number tonight is 270! 04:10 UTC: The Associated Press is reporting that Donald Trump will win Florida and its 29 electoral votes. Florida has the third-most electoral votes of any state. It is tied with New York, which Hillary Clinton won earlier in the evening. 04:00 UTC: Many polls in western states have closed. Hillary Clinton has won many of them, including Oregon, Washington, Hawaii, and California. 03:45 UTC: Clinton has now won Colorado. The western state has 9 electoral votes. Trump's win in Ohio is meaningful. Since 1964, the candidate who won the state has also gone on to win the presidency. 03:40 UTC: Hillary Clinton has also won the state of New Mexico, the Associated Press says. New Mexico has 5 electoral votes. The latest VOA electoral count now has Donald Trump with 169 and Hillary Clinton with 109. 03:35 UTC: Donald Trump has won Ohio and its 18 electoral votes. Hillary Clinton has won Virginia and its 13 electoral votes. Both were very close races. 02:45 UTC: The results are still too close to know who the winner is in important states like Florida, North Carolina and Ohio. 02:40 UTC: Donald Trump has won Louisiana and its 8 electoral votes. The result was not a surprise. Louisiana has not given its electoral votes to a Democrat since Bill Clinton won 52 percent of the vote 20 years ago. 02:10 UTC: Donald Trump is leading in the electoral vote count with 134. Hillary Clinton has won 104 electoral votes. Trump has won Texas, North Dakota, South Dakota, Wyoming, Kansas and Nebraska. Clinton has won New York and Illinois. 02:00 UTC: Several news reports say that the Republicans will maintain majority control of the U.S. House of Representatives. 01:30 UTC: Hillary Clinton now has 75 electoral votes. Donald Trump has 76 electoral votes. But the race is far from finished. The number each candidate is trying to reach is 270 electoral votes. The state with the most electoral votes is California, with 55. Texas has the second-most electoral votes, with 38. That is because they are the two most populous states in America. 01:20 UTC: Tonight, Democrat Hillary Clinton is trying to shatter -- or break -- the "glass ceiling" and become America's first-ever woman president. The term “glass ceiling” is often used to describe an unseen barrier that stops women and minorities from moving up in their careers. Clinton and her supporters have gathered tonight at New York City's Javits Center, where the ceiling really is made of glass. 01:10 UTC: Democrat Hillary Clinton has won Massachusetts, Maryland, New Jersey, Delaware and the District of Columbia while Republican Donald Trump has won Oklahoma. The electoral count is now Clinton - 44 and Trump - 31. 00:55 UTC: Tonight's election will not only decide who America's 45th president will be. Voters will also cast ballots in 34 Senate races and all 435 seats in the House of Representatives. You can read more about this and other issues here! 00:45 UTC: Donald Trump has won West Virginia and its 5 electoral votes. He now has 24 electoral votes. Clinton has 3 electoral votes. A candidate must receive at least 270 electoral votes to win the presidency. Read more about the Electoral College here! 00:10 UTC: Republican nominee Donald Trump has won Indiana and Kentucky, with 11 and 8 electoral votes, respectively. Democratic nominee Hillary Clinton has won in Vermont, with three electoral votes. 23:30 UTC: Welcome to VOA Learning English's live coverage of the 2016 U.S. presidential elections. Tonight, America will choose its 45th president. U.S. presidential candidates Donald Trump and Hillary Clinton attend campaign events in Hershey, Pennsylvania, Nov. 4, 2016 (L) and Pittsburgh, Pennsylvania, Oct. 22, 2016 in a combination of file photos. The Republican candidate is Donald Trump. The Democratic candidate is Hillary Clinton. If elected, Clinton would become the country's first woman president.